Fatty Acids Market for Food Applications was over USD 719 billion in 2019 and may expect gains at over 9.5% up to 2025. Rising awareness among consumers, technological advancements and growing demand in end use industries will stimulate the fatty acids for food applications market size. Fats form a significant functional ingredient in various food products owing to their superior characteristics and are valuable for maintaining a healthy lifestyle. Increasing preference for organic ingredients to enhance cellular growth & brain development and rising health disease rate is likely to drive the fatty acids for food applications market size. Global dietary supplements market size surpassed USD 96 billion in 2017 pertaining to the increasing demand for natural growth promoters for health and wellness. Global food & beverage industry accounted for over USD 105 Billion in 2018 owing to the rising demand for omega enriched food products which provide essential nutrients and vitamins and promote healthy heart & cardiovascular health. These products improve eye health, promote brain development and also find their applications in skincare industry pertaining to their anti-aging and inflammatory capabilities. Rising demand for chemical free products in food processing and growing awareness for a healthy lifestyle will boost the fatty acids for food applications market growth. Global Omega 3 based fatty acids market size for food application may be valued at over USD 34.5 billion by 2025. Omega 3 promotes cardiovascular health and reduces the risk of several infectious diseases. These essential fatty acids contain antioxidants which help in keeping the skin hydrated and help in maintaining youthful appearance of the skin. They are also consumed as food sources & medicines and play a crucial role in enhancing metabolism and contribute to a nutrient rich diet. Increasing consumer inclination towards a healthy diet may drive fatty acids for food applications market demand. Global Omega 6 based fatty acids market demand is likely register significant gains close to 9.8% by the end of forecast period on account for growing health awareness and changing consumer lifestyles for healthy eating. Omega 6 fatty acid contains DHA and EPA which play a significant role in decreasing the risk of several cardiovascular diseases and thereby are utilized in pharmaceuticals, infant nutrition, dietary supplements and several food items. In addition, these fats effectively break down the food and absorb nutrients for optimal function of body and enhance metabolic system. Increasing innovations in food industry and rising demand for natural antioxidants will stimulate fatty acids for food applications market growth. Fatty acids for food applications market demand from saturated type was valued at over USD 170 billion in 2019. These fatty acids are obtained from coconut oil, palm oil, butter fat and form a vital part of nutrition owing to their ability promote blood lipid levels in humans. It also helps in maintaining healthy skin and plays a crucial role in eye and brain development in children, which should stimulate the market growth. Fatty acids for food applications from polyunsaturated type may witness significant growth at over 9.4% by 2025. Polyunsaturated fats provide essential fats such as omega 3 and omega 6 required by the body for cellular growth. Polyunsaturated fats are liquid at room temperature and are found mostly in, seeds, plant-based oils and nuts. They help in reducing the cholesterol level thereby reduce the risk of several heart diseases, which shall drive fatty acids for food applications market growth. Fatty acids demand from dietary supplements application may exceed USD 515 billion by 2025. Rise in demand for high-quality, omega enhanced food supplements may stimulate the product demand. Growing importance of protein rich diet among consumers, investments in technology developments and increasing influence of sports & fitness industry is likely to drive fatty acids for food applications market demand. Fatty acids market size from food & beverages application may witness significant gains at over 9.5% by the end of forecast period. Various vegetarian foods such as green leafy vegetables & soybean oil contain omega 3 which is beneficial for health. Rise in per capita income, growing R&D activities to enhance more food items with fatty acids and consumer inclination towards omega enriched food will boost the product demand in the industry. 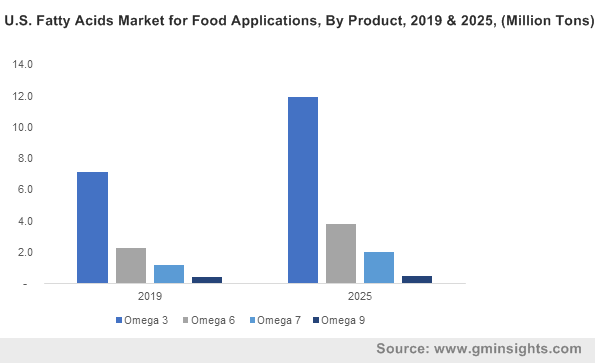 North America, driven by the U.S., Canada and Mexico fatty acids for food applications market size will register significant growth for over 8.5% by 2025. Growing consumer awareness towards consumption of naturally derived protein products in the form of dietary supplement softgels is expected to drive the market growth. Dietary supplements market in North America surpassed USD 40.17 billion in 2017 owing to the increasing importance of protein intake and consumer awareness to maintain health & wellness. Improved technological advancements and growing vegan population are key drivers which are likely to propel fatty acids for food applications market size. Europe driven by UK, France and Germany fatty acids for food applications market demand was valued at over USD 145 billion by 2018. Rise in disposable income and demand for innovative, protein rich food products will drive the market growth. Omega 3, 6 fatty acids are found in several food sources such as soybean oil, walnuts, chia seeds and fruits which are widely utilized in the food & beverage industry in the region. Increasing population, changing lifestyle and growing demand of beverages and baked products enhanced with nutritional value will drive fatty acids for food applications market growth. 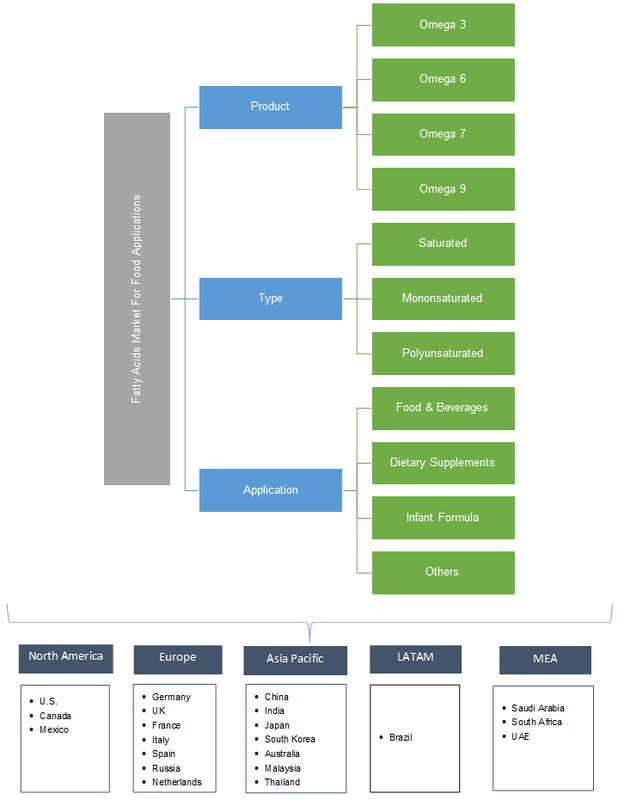 Asia Pacific led by Japan, India and China fatty acids for food applications market size may register significant growth at over USD 10.5% in 2018 and may exceed in the forecasted timeframe. Rising health disease rate in the region has increased the demand of pharmaceuticals to fulfil the required nutrient content of body. Omega based medicines are effective in preventing severe heart problems and lower triglyceride levels which is responsible for increasing the rate of heart diseases and heart attacks. Rising urbanization and economic feasibility will stimulate the fatty acids for food applications market growth. Global fatty acids for food applications market share is fragmented with major industry players BASF SE, DSM, DEVA Nutrition and ADM. Companies are involved in joint ventures and mergers to improve their presence and focus on new product development to obtain competitive advantage. Furthermore, many manufacturers are focusing to produce cost-effective products to facilitate the overall industry growth. Fatty acids are the growth promoters which are not found naturally in the body and are obtained from various plant oils, fruits and green leafy vegetables. Fatty acids perform significant functions in the body such as improve digestion, promote brain & vision health for infants and provide energy to perform various tasks. Polyunsaturated fatty acids are used to avert health diseases and maintain proper nutrient balance in the body which may boost the fatty acids for food applications market growth.